When you consider selecting a moving service, you should select one that is federally licensed, bonded, and insured. It should also have years of experience in moving Utah families. It should also hire only experienced movers. Moving Connections has all of the above qualifications, plus many more. 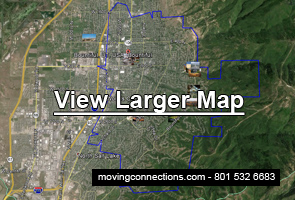 We have been serving the shipping and local moving needs of Utah families and businesses for more than three decades. That’s why we’re a top choice for your Bountiful local residential or corporate move. We have the moving trucks, we have the moving crews, and we have the moving equipment to make your Bountiful move quick, efficient, and smooth. Moving Connections also offers Bountiful "labor only moving help" moves, in which you pack most of your items yourself (leave the heavy and fragile items to us) and you save money by saving our crew the time of packing those smaller items. It’s a win-win situation if you’re good at packing things. If Moving Connections is moving you to Bountiful it's a perfect time to begin to utilize the many resources and bounties of Bountiful. For example click on the picture to the left to go the Moving Connections 'Support - Advice - Assistance' page and discover Bountiful for the first time. Once you are on the 'Support - Advice - Assistance' page go ahead and open the .pdf link found there and tape the list of emergency and useful phone numbers on your refrigerator. Moving Connections has gone to great pains to find those links and connections to integrate you quickly into Bountiful life. The spirit of entrepreneurship is alive and well in Utah. And that means lots of startups. It also means a lot of moving as businesses upgrade or find more advantageous locations to market their wares. Whatever your situation, Moving Connections has a solution for your Bountiful business move. From moving heavy machines to file cabinets to the smallest label printers, Moving Connections has the experienced moving teams to make your corporate relocation a seamless transition. Moving Connections has a “labor only” moving service that can stretch your budget dollars. It does this by allowing you to do the great majority of packing, while our professional moving crew does the loading and handles all the heavy stuff. In addition to doing most of the packing yourself, you also provide your own rental truck and driver to your new destination. Plus you do all the unloading there. So you can save some money with this option, but it does require a substantial amount of “sweat equity” on your part. Moving Connections’ “labor only” move is best suited to those situations where there are a lot of household goods and the customers are confident in their packing skills. i.e., they can pack quickly and safely. If you’re looking for a Bountiful professional moving company, then you’re on the right page. Moving Connections is a Moving Company offering a premier residential moving service and we can give you a quick price quote for your Bountiful move right now. And if you need it, we also offer a competitively priced storage service, including climate controlled storage for those items requiring it. This full service move is Moving Connections’ most popular option, since it takes away so much of the tension and worry of relocating to a new residence. With all the hundreds of details to take care of in a typical move, it’s good to leave the hassles of packing and loading and driving to a professional Bountiful moving crew while you field the other problems, such as forwarding your mail, turning off utility services, and calming the fears of family members who are leaving friends and familiar surroundings.